I’ve had these little bunny pops in my mind’s eye for a while now. I’ll precursor this post with saying they don’t look exactly how I imagined. Sure, they do look a bit like Pikachu, but they are scrummy, so I vote worth the time if you’ve a free afternoon and a healthy dose of patience in your arsenal. Combine the sugar, 150ml/5 fl oz water (different to the gelatine water) and the liquid glucose in a smallish saucepan. 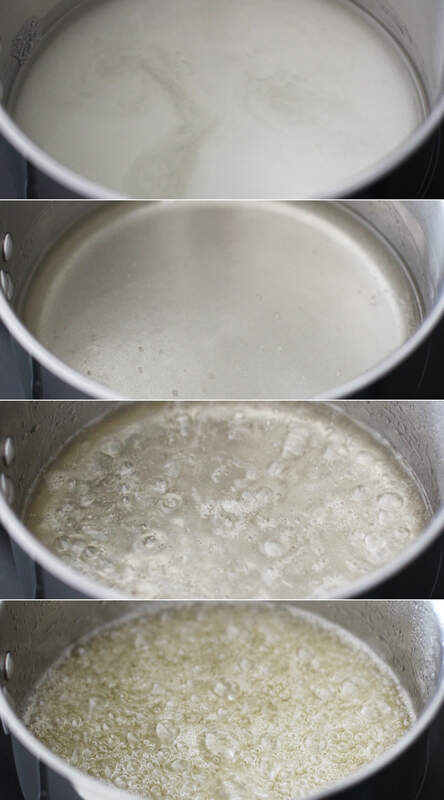 Allow the sugar to dissolve on a low heat, and then turn it up to medium-high. Be careful not to burn the sugar or any of your extremities. 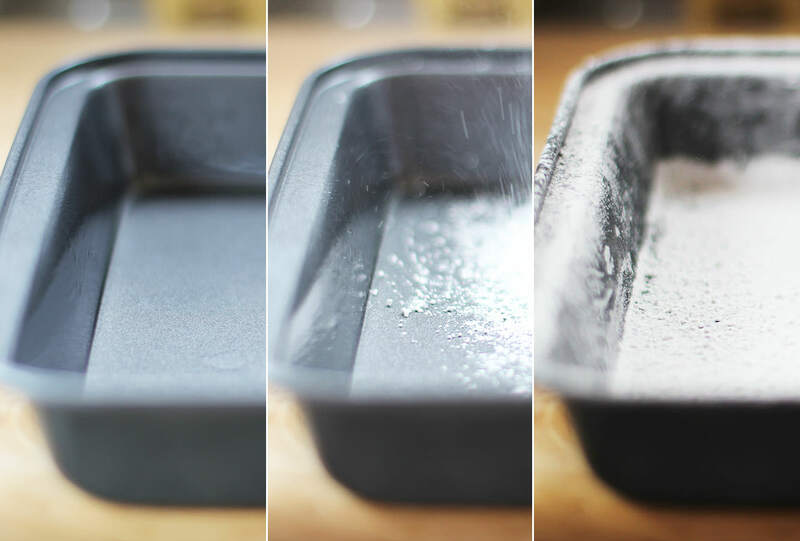 While the sugar is bubbling away take the opportunity to dust a brownie tin with icing sugar. Use a really small amount of olive oil before dusting to hold the icing sugar to the pan. 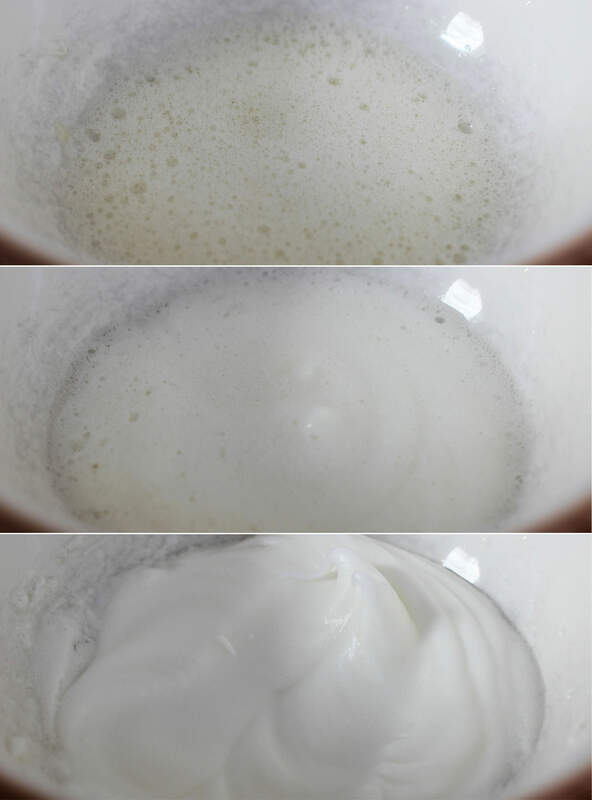 Place the egg whites in a metal or glass bowl, never plastic. Or you know, if you want to wreck your lovely Mason Cash bowl by using an electric whisk on it, by all means do. Those handsome grey marks? You could have those too. 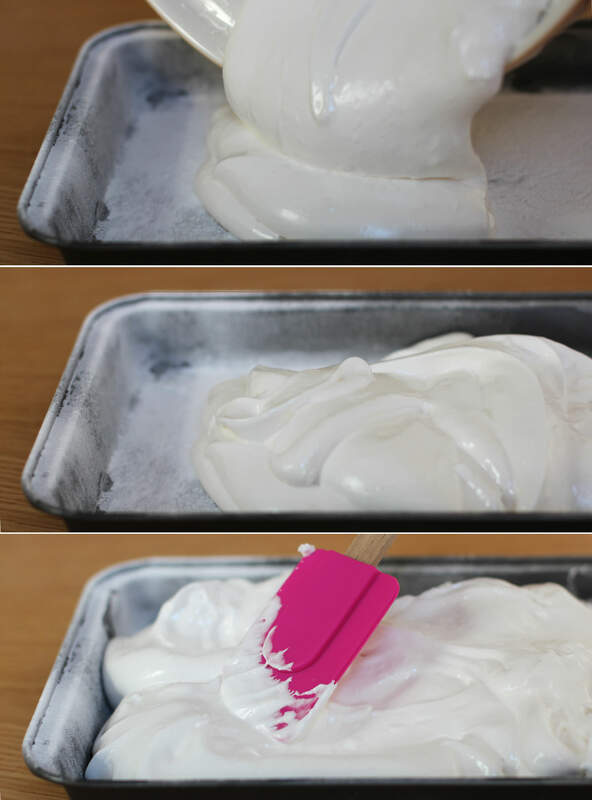 When the sugar gets to somewhere around 112-115C whisk the egg whites into stiff peaks. Somewhere during the whisking (probably when you need to give your arm a rest) add the flavouring. Vanilla extract is lovely in these but they will take basically anything you fancy. Like I said in the ingredients list I really recommend ‘Buttery Caramel’ from the Natural Professional Flavours brand. 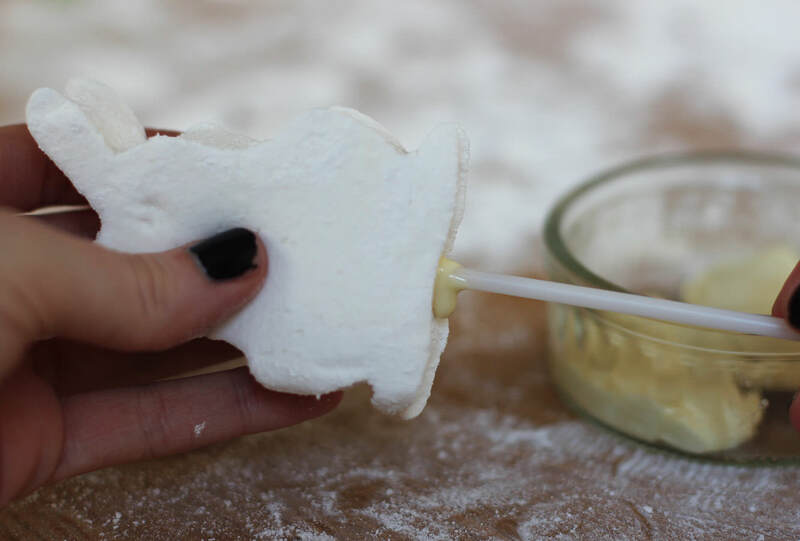 Turn the marshmallow out onto a clean surface. 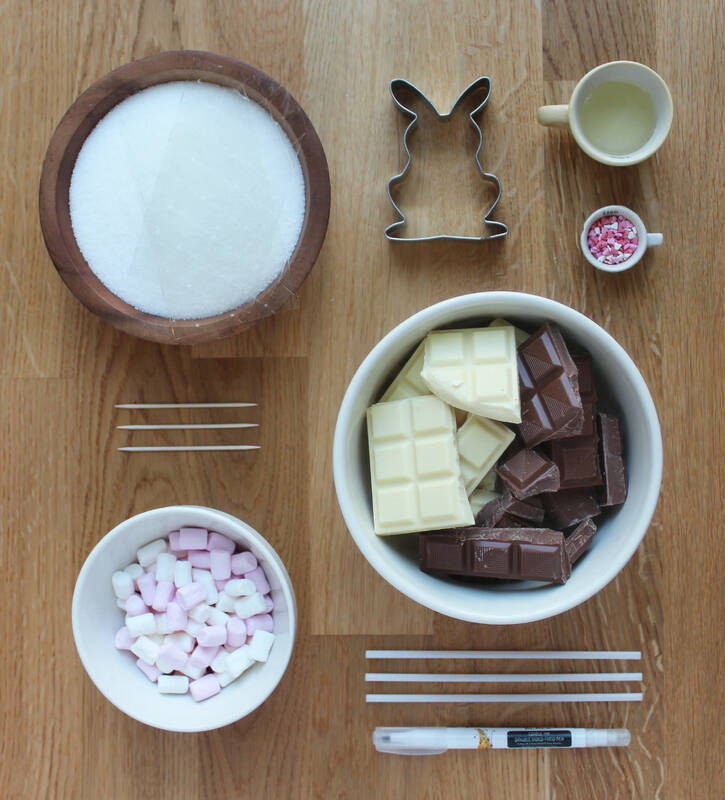 Cut as many bunnies as you can out of the sheet of marshmallow. This will vary depending on your tin and cutter size. I got nine out of mine. Melt a couple of pieces of chocolate in the microwave. 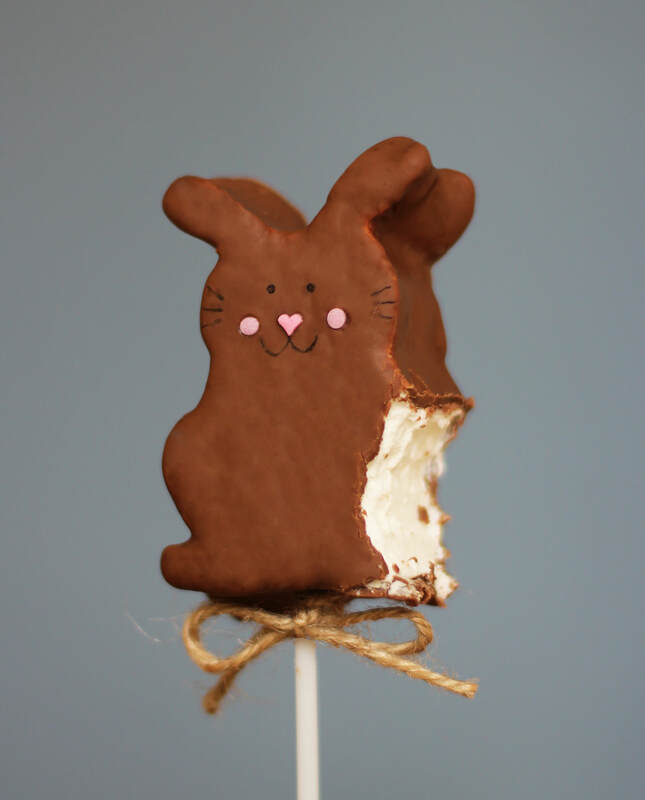 Dip the cake pop sticks in and push them into the bottom of the bunnies. I put mine in up to the head to increase stability. Leave to set. I recommend tempering the chocolate. Then you will get a nice snap when you bite into the pops and you can use the remaining chocolate to do something like this. Don’t feel you have to though, it will work without. To temper, melt two thirds of the chocolate over a pan of boiling water and allow it to reach 45C. Remove it from the heat and add the rest of the chocolate. This should melt in and cool it down quicker. Stir it to cool down to 25C. Place it back on the heat to get it back up to 28C. 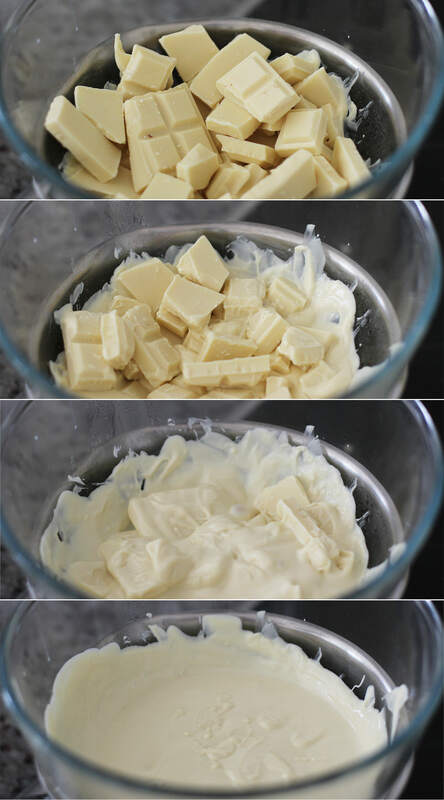 Place the chocolate into a small deep bowl (or I actually found with the milk chocolate that a glass works really well). 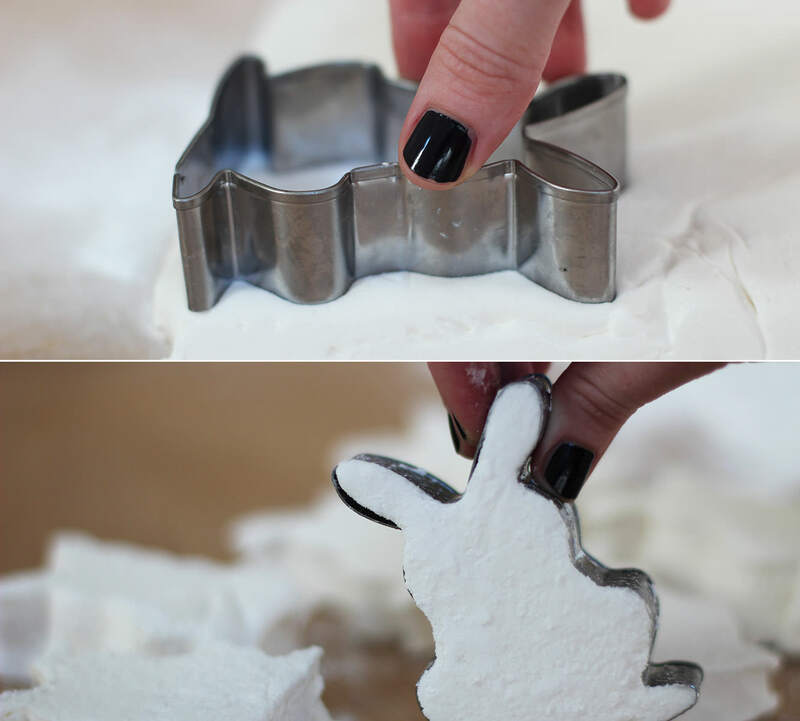 Dip the bunnies in and make sure to coat well. 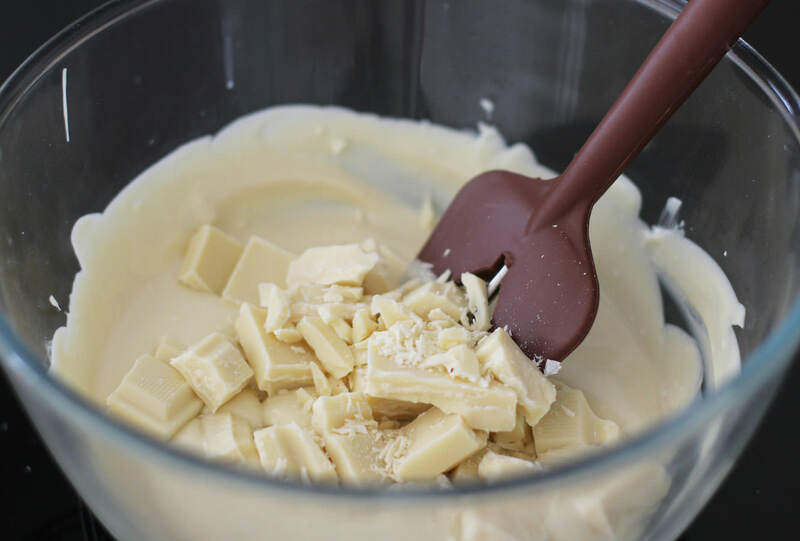 Allow excess chocolate to drip off, twirl it round to get an even, smooth coating. This is where I ran into a spot of difficulty and filled my left hand with bunny pops that were covered in melted chocolate. I suggest you a) get a spare pair of willing hands, b) get a block of florist’s oasis/cake pop stand to stick them in, c) accept the back of them won’t be beautiful and lay them down on cellophane or greaseproof paper. Once dry, add their little faces and tails. 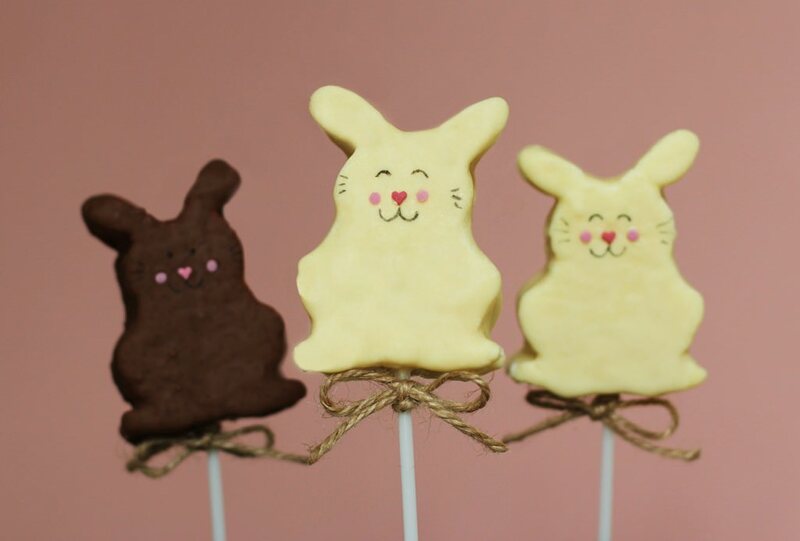 I used a cocktail stick with a small amount of melted chocolate to stick on sugar decorations. I got the little hearts I used for the noses from Tiger, and I can’t be sure about the circles for the cheeks. I drew the faces on with an edible ink pen I bought online. You could use a cocktail stick and some dark chocolate if you prefer. Tie a piece of twine or ribbon around the stick and make a day a little bit happier. February. For me, the pits of the calendar. Nobody really needs February. It just extends winter for too long, and personally, by the time we’re a week into it I’m ready to bid farewell to the chilly winds and rains and usher in March and April. This time round however, Spring came early to a very special household. 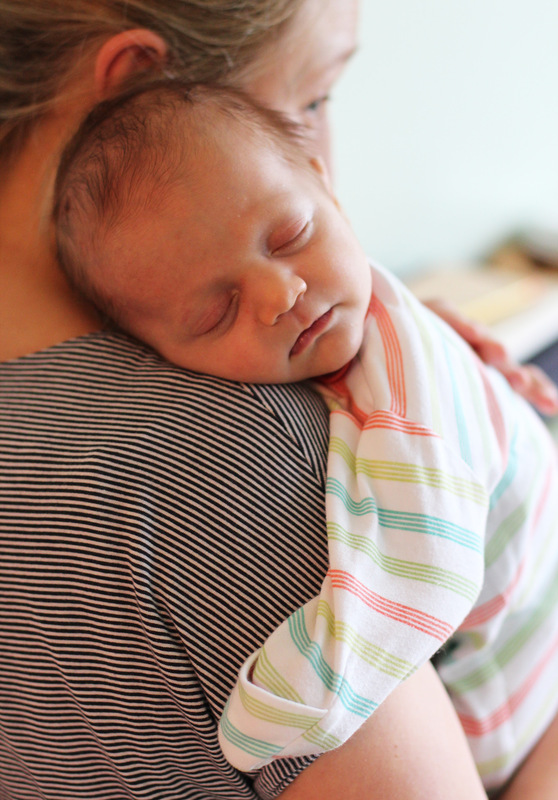 My wonderful friends Hannah and David had a BEAUTIFUL baby boy earlier this month, shaking off the winter blues. I’m head over heels for the little bundle already and can’t wait to see him grow. As if I needed an excuse to craft eh? 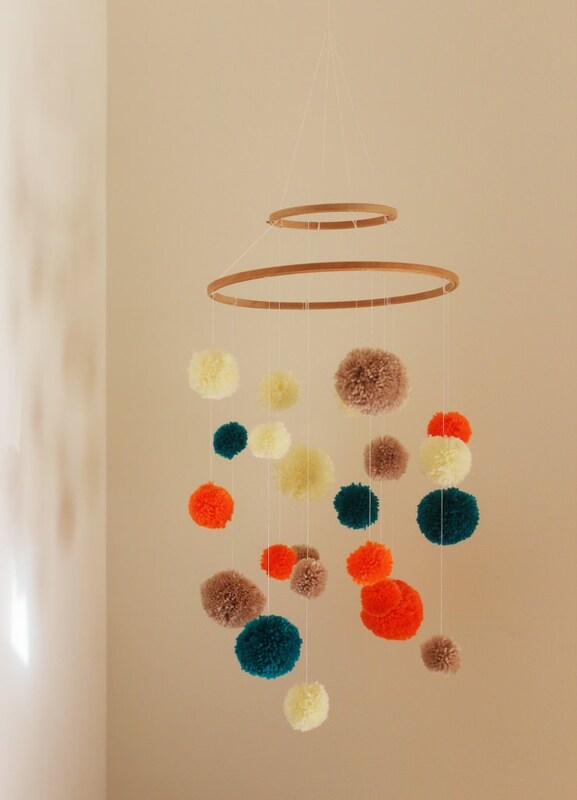 This is a great little project if you already have kiddies and are expecting another, as the older siblings can definitely lend a hand. For the impatient ones, yes, there is a picture of bubba at the bottom. 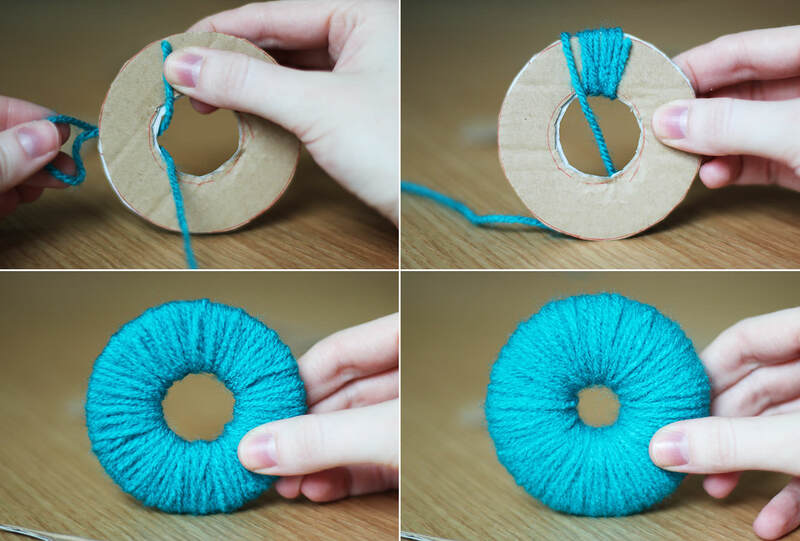 For those of you without pom pom makers (for goodness sake buy some) draw round a variety of circular objects to make differently sized cardboard hoops for your pom poms. 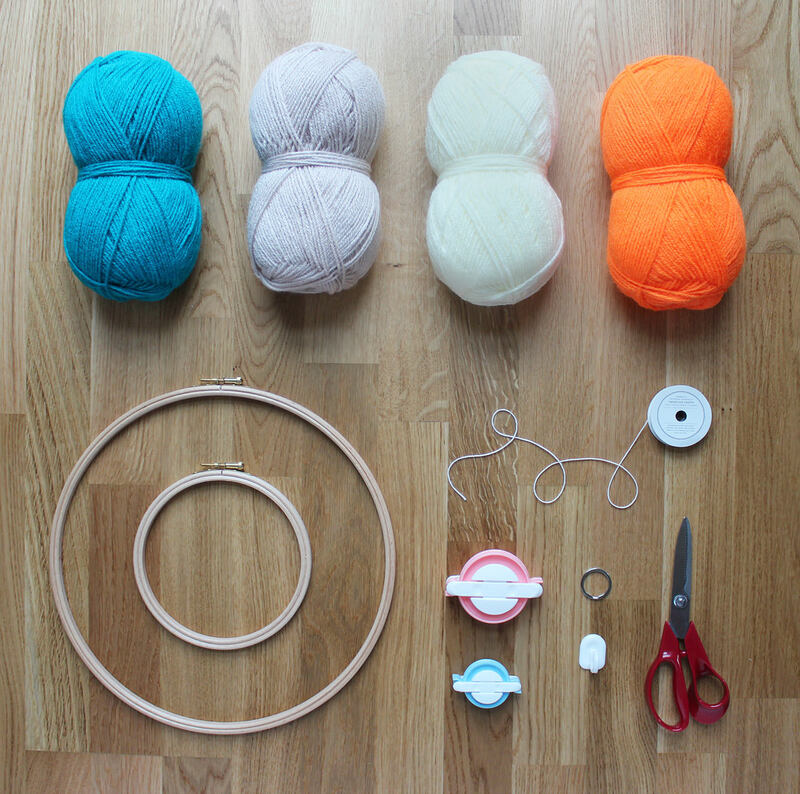 You will need to make two hoops per size. 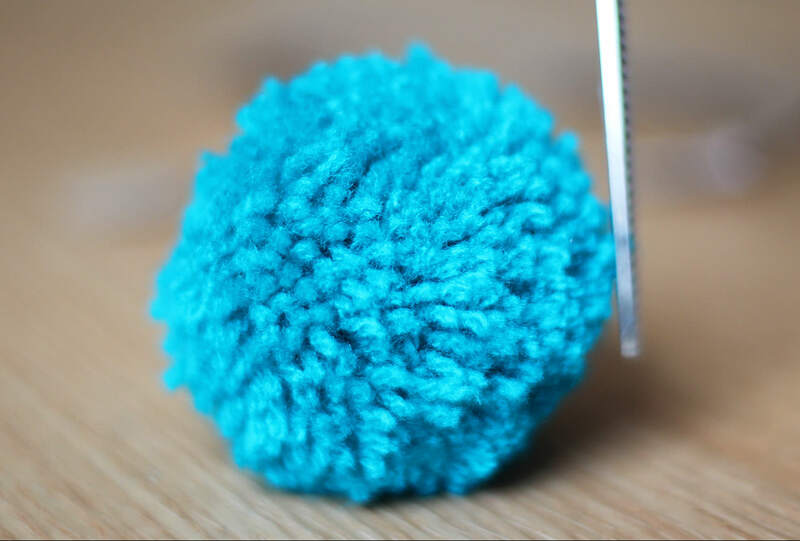 If you have pom pom makers, none of this is for you, skip to step 8 and relish in the fact you loved yourself enough to shell out £4 to save your sanity. All you guys need to do is follow the, in all likelihood hilariously translated, instructions on the back of your packet of pom pom makers. I bought mine on eBay from China, I strongly suggest you do the same. 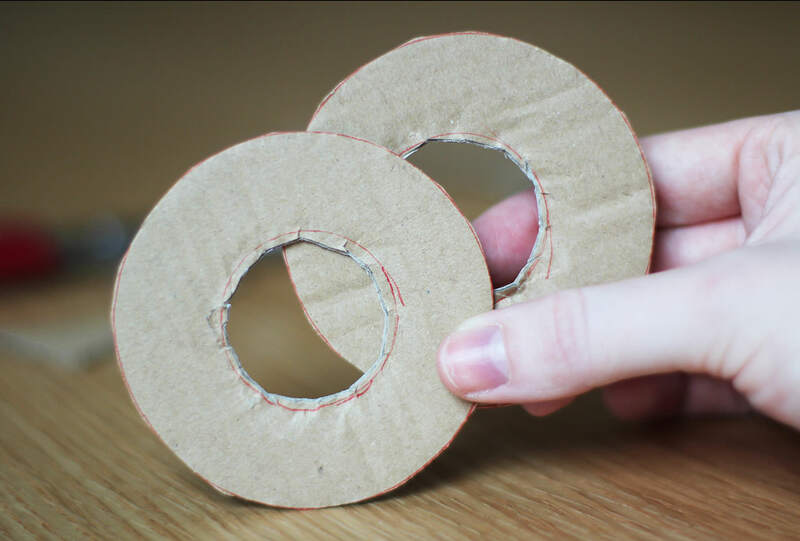 Cut out the hoops so that you have a hole in the centre. Don’t worry if they’re messy, it won’t impact your poms. Sandwich the two pieces of cardboard together and wrap lengths of wool around and around. You do this by pulling the end of the wool through the centre of the disk and back over the edge. 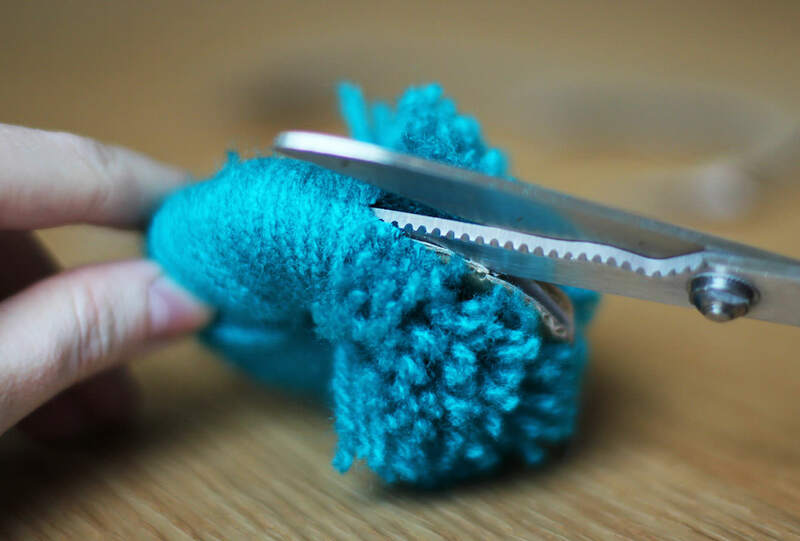 Keep going as long as you can, but essentially the fuller the hole in the middle the plusher your pom pom will be. Using scissors cut round the circumference of the ring. Once you’ve made a few snips you should be able to get the scissors between the two layers of card which then makes this very quick. 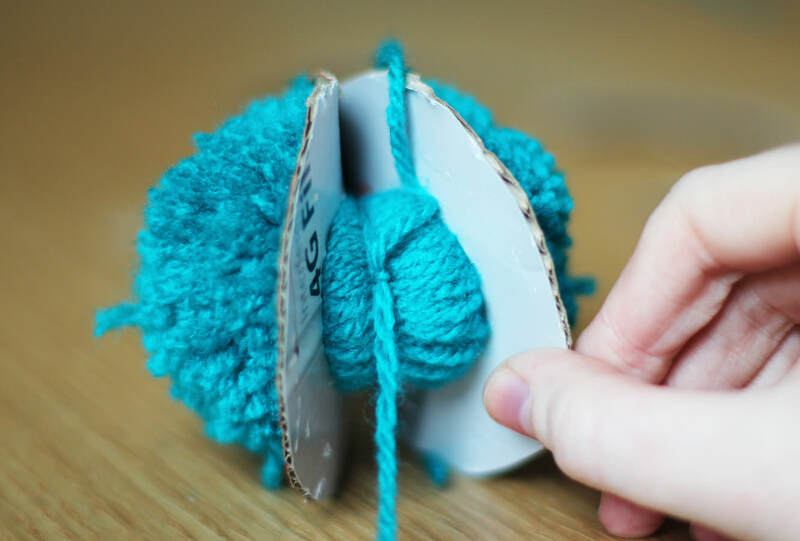 Wrap a length of wool around the edge and tie a knot in between the cardboard layers. I always do a few for good measure. 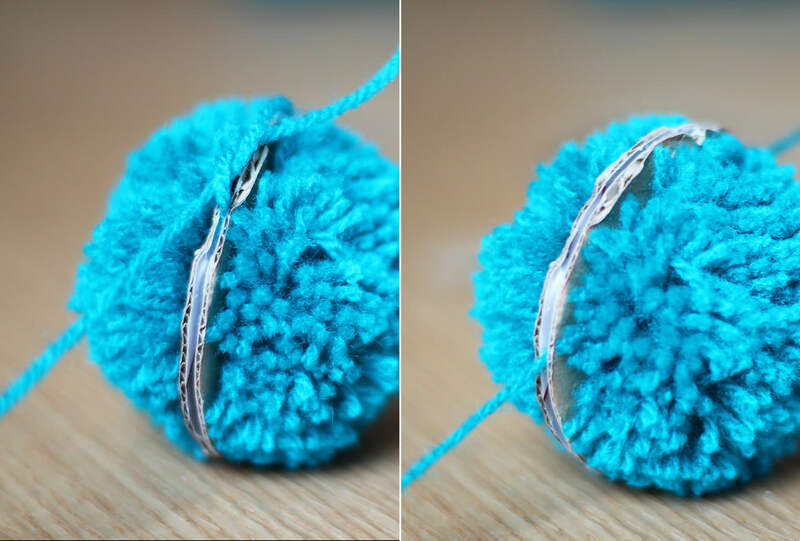 Pull the cardboard rings off to release your pom pom. Trim any straggly bits to neaten it all up. 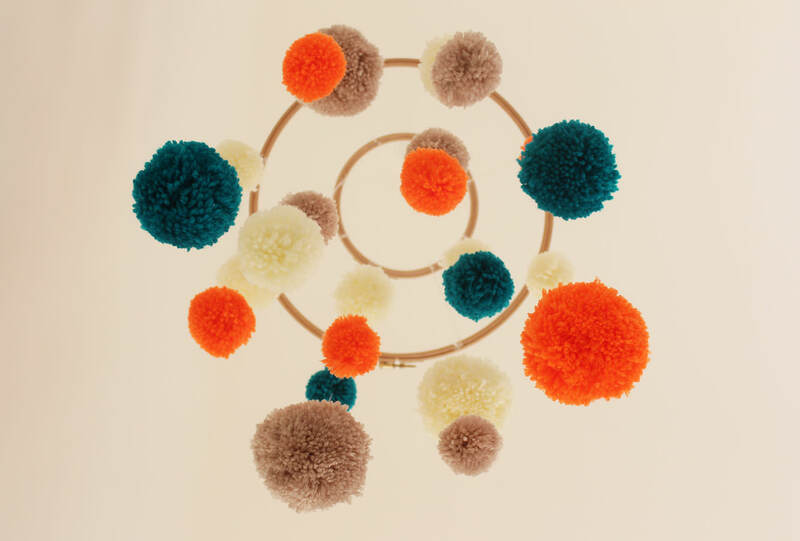 Repeat until you have at least 24 pom poms of different sizes and colours. 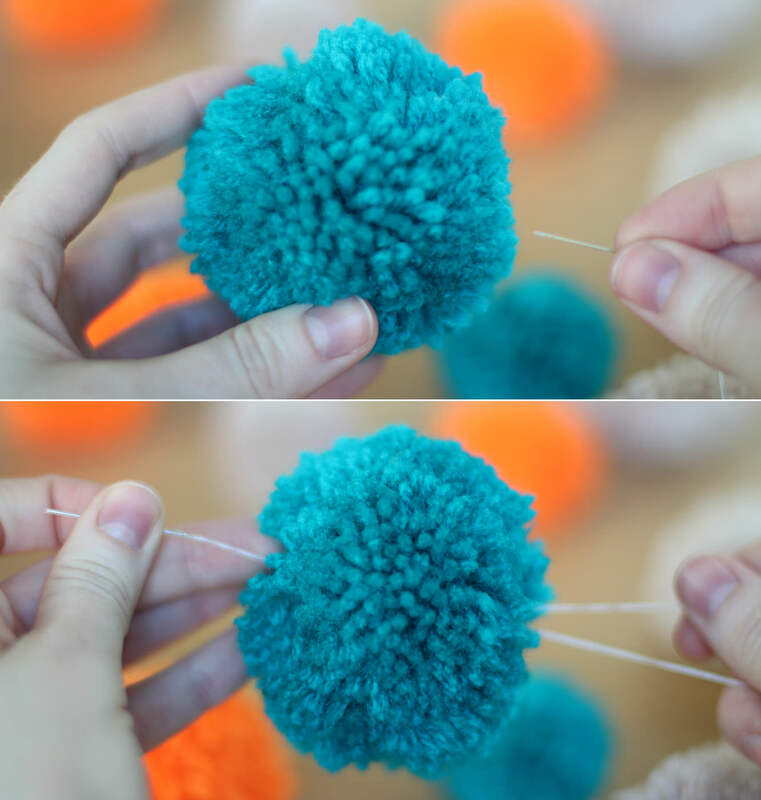 I went back and forth through each pom pom a few times so they didn’t slip down/fall off the end. I recommend doing this randomly, or you’ll drive yourself crazy! Plus it looks better for baby if they are dotted about as the different levels of perspective means you can see more. 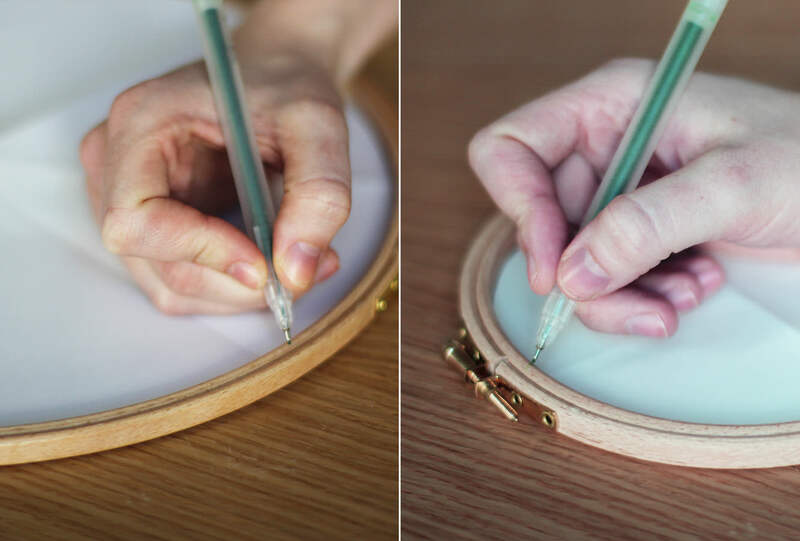 Cut a paper/newspaper circle that fits inside the embroidery hoops. Fold each in half three times so you get 8 equal segments. Placing the paper circles into the hoops mark out the eighths. 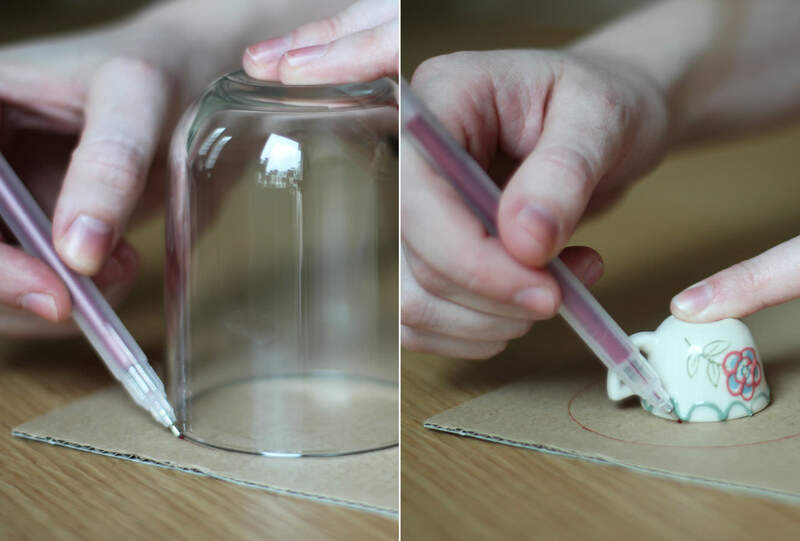 Remove the outer hoops and stick a small strip of double sided tape by each marker. 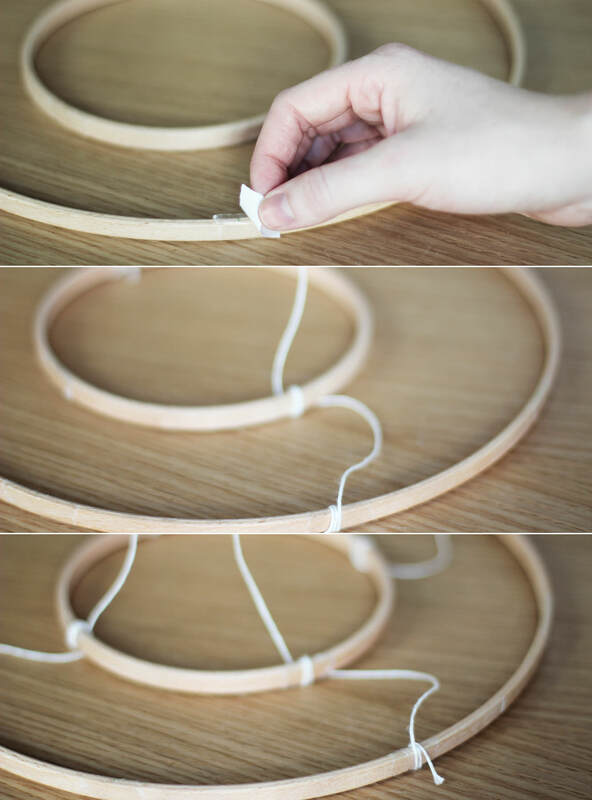 Attach two pieces of string to hang the mobile by. They need to wrap around both the outer and inner hoops and be as even as possible. 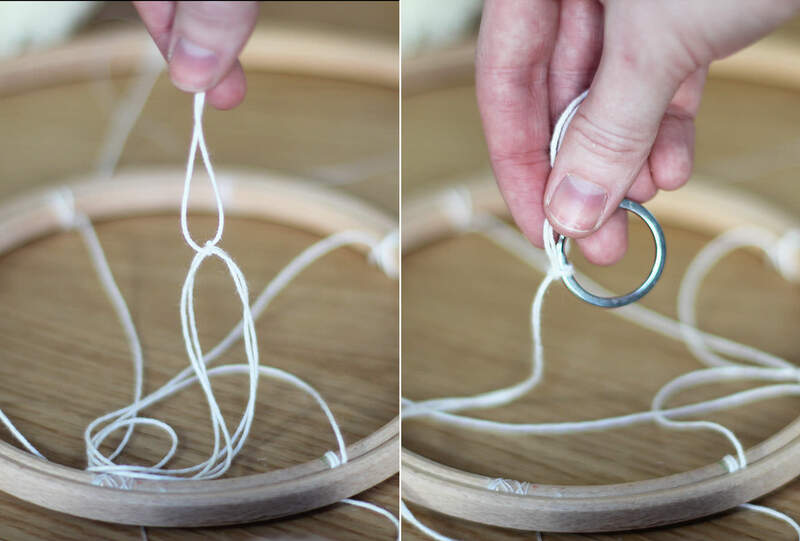 Try to make it so that the string comes out from under the hoop at all points. Otherwise you’ll do what I did and put the outer hoop on top, one will be over and the whole thing will hang a bit wonky. Distressed isn’t the word. Tie a longish piece of string (this will totally depend on your ceiling to cot distance) to connect the crossed over pieces you just attached to the hoops. Still with me?! At the other end of that length of string tie a keyring. This is the bit that will enable your mobile to spin round. 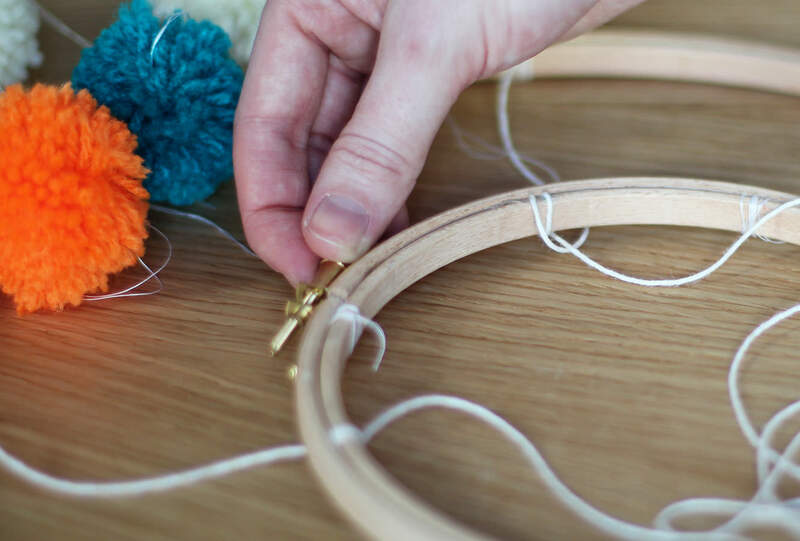 Attach your pom pom lengths, 8 around the outside, 4 around the inside by wrapping the thread round the hoop a few times. The tape should hold them in place quite well. Reattach the outer hoops and tighten. Using the sticky hook hang from the ceiling. Lie under it for a little while. It’s relaxing being a baby. I also couldn’t resist making baby a little friend to match his mobile. Introducing Bernard the bunny. I haven’t included a step-by-step for Bernard because he’s not my pattern. In fact, this was the first time I’ve ever knitted a ‘creature’ before. He’s not quite the masterpiece I envisaged when I started but full of character and a great beginner knit. Bernard was knitted from the free fuzzy lamb pattern by Barbara Prime (I just added longer ears). I urge you to visit fuzzymitten.com where you can buy all kinds of super cheap cute and quirky patterns including a bikini clad alpaca and a sloth in a poncho. 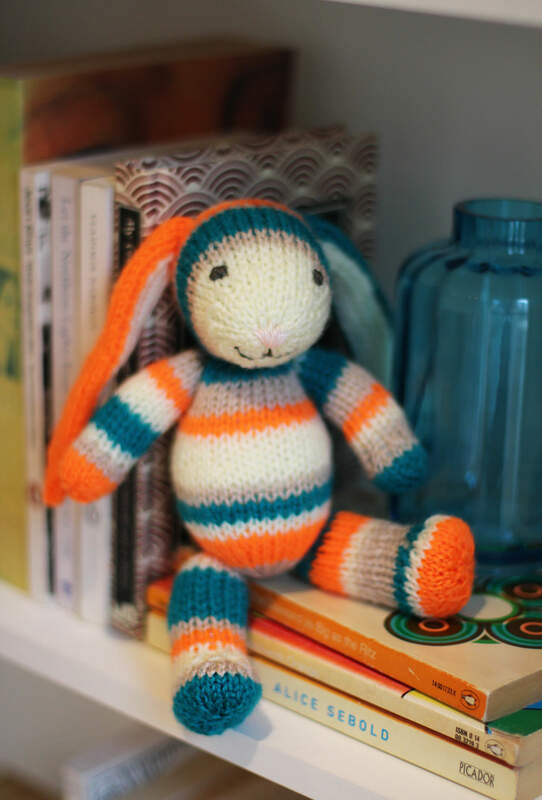 Barbara’s patterns are adorable and easy to follow. 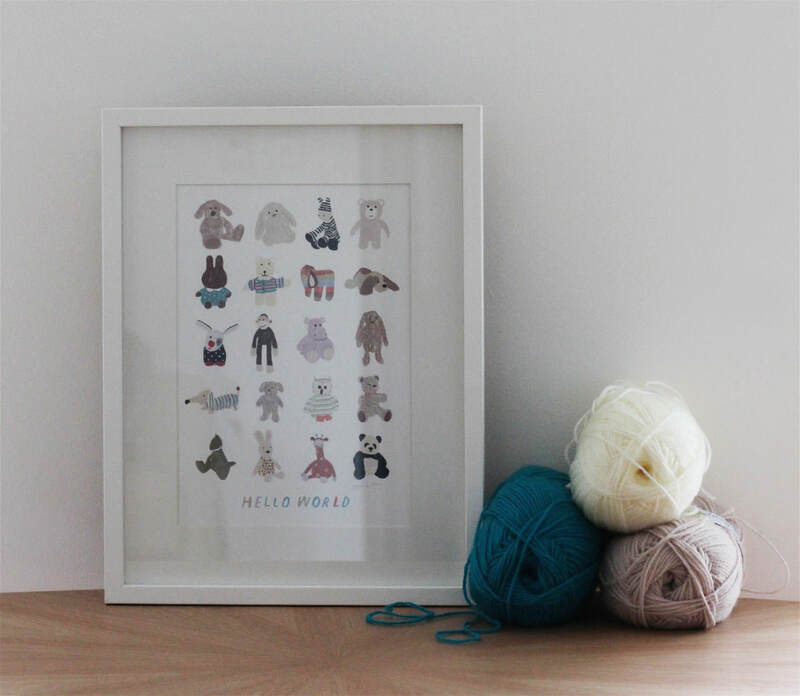 Another plug goes out to Hannah Melin whose ‘Hello World’ print I couldn’t resist at a craft fair just before Christmas. I think it would look lovely on the wall of any nursery. I should probably make it clear that I’m not being sponsored for either of the above, I just think it’s good to support one’s fellow craftspeople from time to time. Without further ado, here’s the man of the hour LOOKHOWCUTE.